Tranexamic Acid Injection is administered when every second counts to stop acute bleeding. 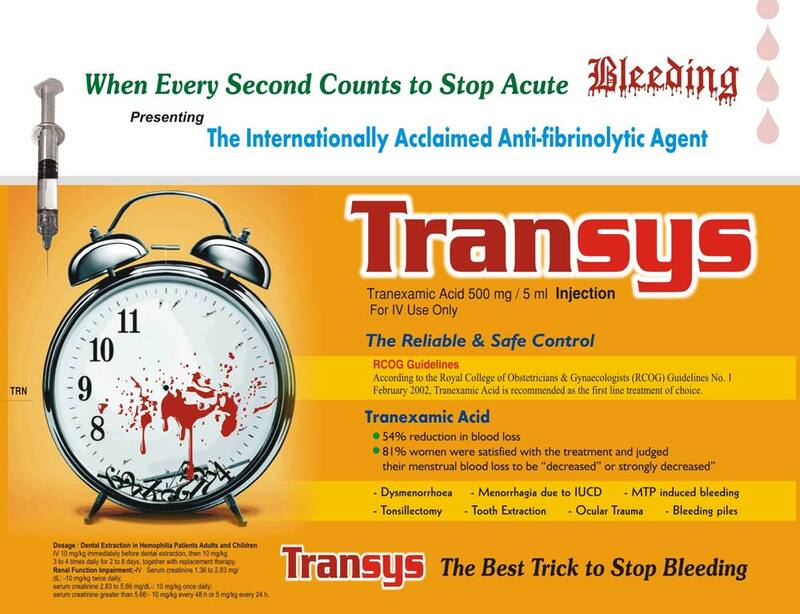 The internationally acclaimed Tranexamic Acid Injection is an anti-fibrinolytic agent for reliable and safe control of acute bleeding. Considered the best solution to stop the bleeding, Tranexamic Acid 500 mg / 5 ml injection is ideal for IV use only. RCOG Guidelines : According to the Royal College of obstetricians & Gynaceologists (RCOG) guidelines No. 1 February 2002, Tranexamic Acid is recommended as the first line treatment of choice. 81% women were satisfied with the treatment and judged their menstrual blood loss to be "Decreased" or strontly decreased"
IV 10 mg/kg immediately before dental extraction, then 10 mg/kg 3 to 4 times daily for 2 to 8 days, together with replacement therapy. Serum Creatinine greater than 5.66 - 10 mg/kg every 48 h or 5 mg/kg every 24 h.